Learn how to apply nail polish so it stays longer in 4 steps. This article will explain in details a great secret from a veteran nail tech on how to apply nail polish the right way. It's rather long but it's worth the effort and time. So please read carefully. Step One: Clean, Clean, Clean! Your hands and nails should be nice and clean and dry and ready for the application of Nail Polish That Lasts. Double check to make absolutely sure your nails are completely free of oils. This is probably the MOST important reason your polish might not wear well. If you have any peely spots on your nail, go over them one more time with your 3 or 4 way buffer, and if you did not buff your nails during your manicure, do so right now, starting with the most abrasive side and finishing with the smoothest side, being sure to cover the whole nail surface lightly. This will make a tremendous difference in the overall look of your polish, I cannot stress it enough. Make sure you have everything you might need for the polish sitting out (don’t forget your cuticle pusher and acetone to clean up the inevitable mistakes), and anything you might need in the next two hours handy. Yes, two hours. When you are happy with the look of your nails, put some acetone on a gauze square, and go over your nails one time very well, getting into the grooves on each side of your nails, and underneath as well. This will cause any bit of water left in your nails to evaporate, and will clean off any unseen residual oils from your Spa Manicure or Treatments. Do not shake your base coat bottle, but turn it upside down slowly just a couple of times. Pull the brush out of the bottle, wipe the brush off on the rim of the bottle, making sure there isn’t a lot of polish running down the neck of the brush, then dip the brush back in just to the top of the bristles. Let the drop of polish that will want to come off the brush come on off, but other than that one drop, you want your brush nice and loaded with polish. Starting with the pinky of your “right” hand (your dominant hand – this could be your left hand, if you are left handed! ), paint a coat of medium thickness on your nails, beginning right next to your cuticle, and pulling your brush straight out, all the way off of the end of your nail. Be sure and cover your whole nail, from side to side, and cuticle to end, always going from cuticle to end, never putting “plops” of polish down, then spreading it out. When the top of your nail is covered, take the brush and slide it right across the tip end of your nail, coating the edge with base coat. If you have any spots that want to run, wipe them off and do them over. You will get the hang of this quickly. Unlike other people that might tell you to let your polish dry between coats, I am going to tell you to put it all on in one fell swoop. Nail polish is chemically designed to bond together, and as it all dries, it forms a coating that is much more durable if it all dries together. I promise that your nails will be dry enough to function just as quickly this way as they would be if you let your polish dry between coats. The application of color is slightly different than that of the basecoat. Prepare the bottle by rolling it across the table, or between your palms, turning it upside down a time or two. NEVER shake your polish; this will almost definitely cause bubbles to appear in your polish. Prepare the brush the same way as you did the base coat, wiping the brush well when you first pull it out of the bottle, then redip the brush just to the top of the bristles. This time, rather than just letting that first drop go and then applying the polish, you want to slightly wipe one side of the brush against the rim, leaving just slightly less color on the brush than you did with the base coat. As you might expect, you will be putting thinner coats of color on than you did with the base coat. 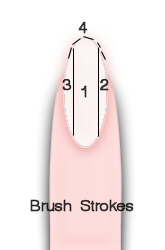 Starting again with the pinky of your “right” hand, apply the color in three strokes only, the first down the center, and then one more on each side. Again, always start right next to the cuticle and pull the brush straight out, all the way off the end of the nail. After you have your three strokes done, run your brush across the tip end of the nail, just like you did with the base coat. Over my 18 years of doing nails, most of my clients have told me that they have never had polish stay on like mine does, and also that I am the only manicurist they have ever had who polished the tip ends of the nails. See the connection? Now, the polish is going to look streaky and terrible to you now, and most mistakes in polishing are made right here, when people try to make the first coat look perfect. Just let it go for now. I promise the next coat will make it look much better. Go for that second coat, just as soon as you are done with the first one. Do it exactly the same way, remembering to coat those ends! Doesn’t it look much better now? If you are doing your toenails, STOP HERE! If you are doing your fingernails, then you are ready to immediately carry on to the Top Coat step. With top coat, you want a nice even coat, applied not so thick that it globs, and not so thin that it leaves streaks and holes. You may have to load your brush a few times to get the hang of how much polish to leave on there, but your aim is to have enough polish on the brush to cover the entire nail without re-dipping, but not so much that it wants to drip before you put the brush to the nail. When you first pull your brush out of the polish, you will want to wipe off the brush on the sides of the rim, just like you did with the base coat and the polish, and then redip your brush to the top of the bristles. If there is a big drip getting ready to come off the brush, let it drip back into the bottle, if not, then go ahead and apply to your nail. You should be able to get your nail coated in the same “three strokes” manner as your color, but if not, that is ok.
Be absolutely sure to run the brush across the tip end of your nail, this is the coat that you do NOT want to forget to do that with. Christina Jones is 20-year veteran of the beauty industry. She has worked in full service salons and day spas. She has owned a nail salon, as well as worked for JTV, Jewelry Television (formerly ACN, America's Collectibles Network) as the nail tech for the show hosts. Was raised in Tennessee, but reside in Texas now, she is a wife and mother of 3. She loves computers and all things geeky, the outdoors, gardening, building things, family, animals and life in general. In all her spare time she also is a channel editor for b5media.com for the Arts & Crafts, Beauty & Style, Home & Dining and Travel & Culture channels. Visit her website at http://www.nailtechsecrets.com.